Project your presentation far and wide, from any position, while using the wireless podium mic that comes with this sleek sound lectern. You can choose from three wireless microphone styles, to find the best option for your guest speakers and lecturers. Your days of searching for a microphone and amplifier that suit your lectern are over. 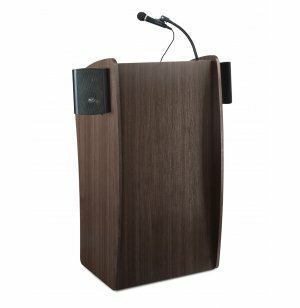 The Vision Sound Lectern includes a built–in sound system, so there is no need to look for the necessary attachments. 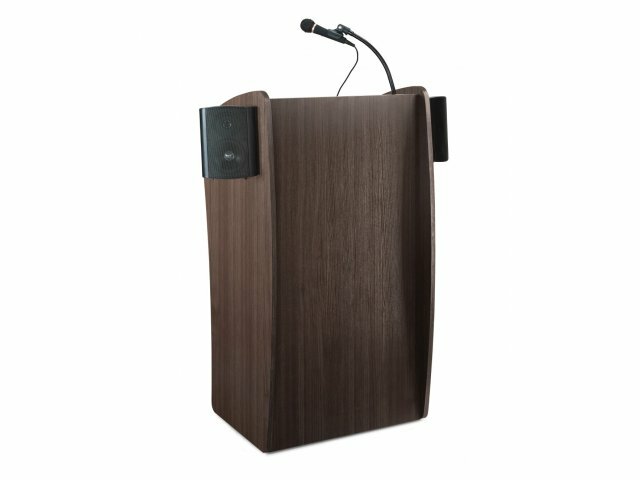 This podium comes fully equipped with a wireless mic, a wired handheld mic, wired tie–clip mic, and two detachable speakers, so lecturers can choose the microphone that best suits their purposes. The 30–Watt amplifier is powerful enough to address an audience of 900 people. The Vision’s practical features are presented in a stylish, visually appealing, package. Its sleek curved appearance creates a modern professional look. Constructed from ¾"–thick, stain– and scratch–resistant modern cherry laminate, this lectern will remain attractive through years of use. Public speeches will sound great and look professional when delivered from the Vision Media Lectern. All Inclusive: Sound package includes a wired tie–clip mic, wired handheld mic, wireless mic of choice, and two detachable speakers.